The industry standard for decades, the Audion Sealboy by Packaging Aids Corp. is a manually operated table top hand sealer. Rugged, high-quality construction for large workloads of up to 1000-1200 bags per day. Seals PP/PE bags/film to 10 mil. 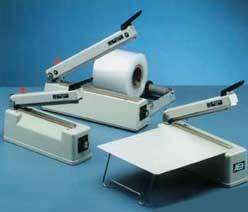 Comes in 2 models: 236-SBSA (9”) with timer & cutter, 321-SBSA (12") with timer & cutter. Units with sliding knife cutters trim the bag approx. 1/4 inch above the seal line. Very easy to maintain--the sealbar pops in and out in less than a minute and you are back in production. Models shown: 236-SBSA (left) with sliding knife cutter, 321-SBSA (center back) with sliding knife cutter and optional rolloflux for layflat tubing, and the discontinued 236-SBA (right) showing the optional workshelf. Click here for Replacements Parts for Audion Sealboy. Items usually ship in 3-5 Days, FOB: San Rafael, CA.